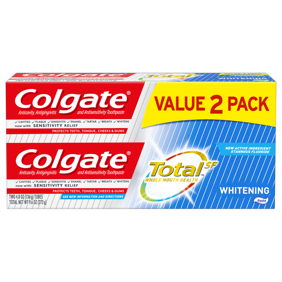 Colgate Kids 2-in-1 Toothpaste and Mouthwash, with a great Strawberry Smash flavor, combines toothpaste and mouthwash into one gel in an easy to dispense formula for less mess and more fun! This 2-in-1 toothpaste and mouthwash formulation provides clinically proven cavity and enamel protection like a toothpaste while freshening breath with Strawberry Smash flavor like a mouthwash. This bright and colorful package combined with a fun strawberry flavor will encourage your kids to brush for a lifetime of bright smiles. WARNINGS. KEEP OUT OF REACH OF CHILDREN UNDER 6 YEARS OF AGE. If more than used for brushing is accidentally swallowed, get medical help or contact a Poison Control Center right away. Ingredients: Active Ingredient - Purpose.Sodium Fluoride 0.24% (0.15% w/v Fluoride Ion) - Anticavity.Inactive Ingredients: Sorbitol, Water, Glycerin, Hydrated Silica, PEG-12, Sodium Lauryl Sulfate, Tetrasodium Pyrophosphate, Cocamidopropyl Betaine, Sodium Saccharin, Flavor, Xanthan Gum, FD&C Red No. 40. Active Ingredients: Active Ingredient: Sodium Fluoride (0.24% (0.15% w/v Fluoride Ion)). Purpose: Anticavity. Instructions: Directions: Remove tab with arrows to open cap. Adults and Children 2 Years of Age and Older: Brush teeth thoroughly, preferably after each meal or at least twice a day, or as directed by a dentist or physician. Children 2 to 6 Years: Use only a pea sized amount and supervise a child's brushing and rinsing (to minimize swallowing). Children Under 2 Years: Ask a dentist or physician. I use it because it doesn't burn my mouth. It may be a "Kids" toothpaste, but it is also a mouthwash. I use it because it doesn't burn my mouth. It doesn't whiten or promise a better smile. It cleans my teeth and my breath with a great flavor. It is extremely difficult to find a dentifrice that doesn't have a mint taste or other sharp taste. This and watermelon from Colgate are the only ones I have found and they are both difficult to find.